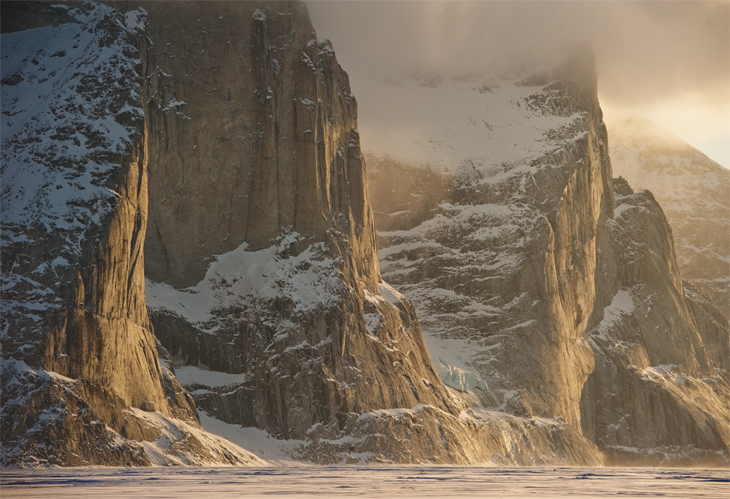 Baffin Island in Canada’s eastern Arctic is a maze of blue ice, chalky snow, hungry polar bears and soaring rock cathedrals. Photographer Jordan Manley sheds some light on what it’s like to ski and survive in one of the world’s most isolated places. 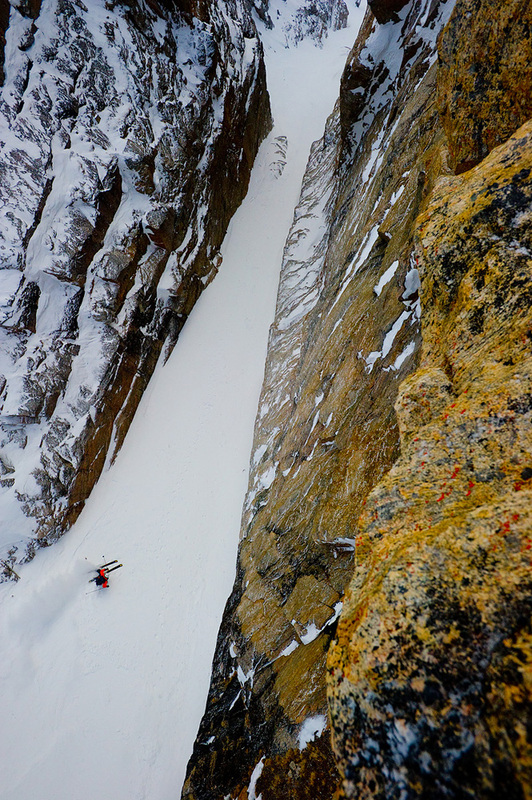 Island with skiers Chad Sayers, Marcus Waring, Tobin Seagel and Jamie Bond to ski the long, hazardous couloirs around Sam Ford Fjord. 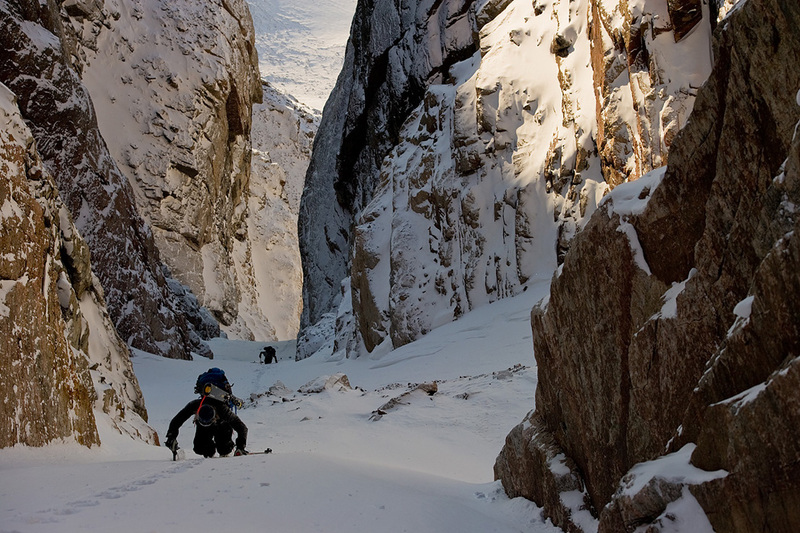 Skiing through towering 2-billion-year-old rock hallways – sometimes on only a few inches of snow underlain by blue ice – they had to make every turn count. The nearest rescue helicopter was rumoured to be roughly 3000 km distant, in Halifax. 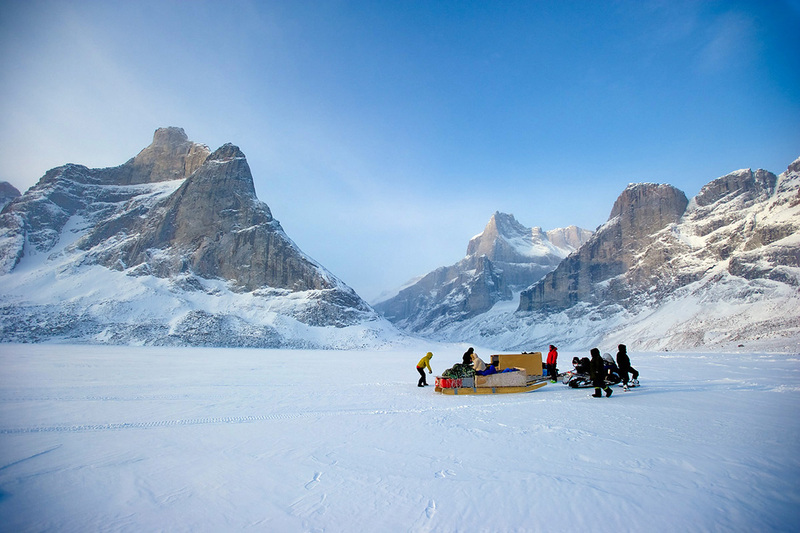 The most unique part about skiing on Baffin Island was living on the frozen ocean. 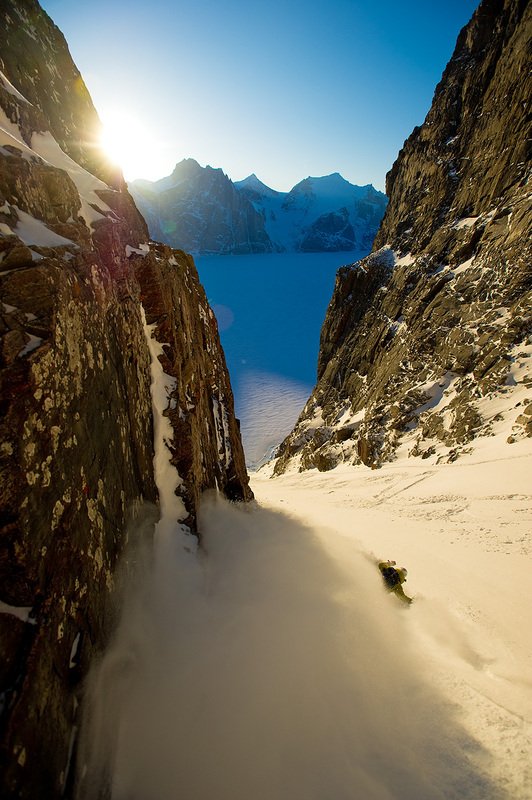 We would push, skate, and skin up to 30 km a day from our base camp to the bottom of some of the largest, most intimidating couloirs in the world. There was very little shelter. Our tents were our lifelines, anchored into the sea ice with ice screws. It was amazing to think that the ocean floor was hundreds of metres below us. ords along ancient fault lines, while the rock fractured in a unique way, producing these gigantic walls, cathedrals, and hallways. in, dragged behind a snowmobile driven by two local Inuit hunters we had hired. Bumping along the sea ice for six hours at -30°C, it was a cold that penetrated deeper than we had ever experienced. As we entered the fjords, we were at once frozen and awestruck in our new surroundings. 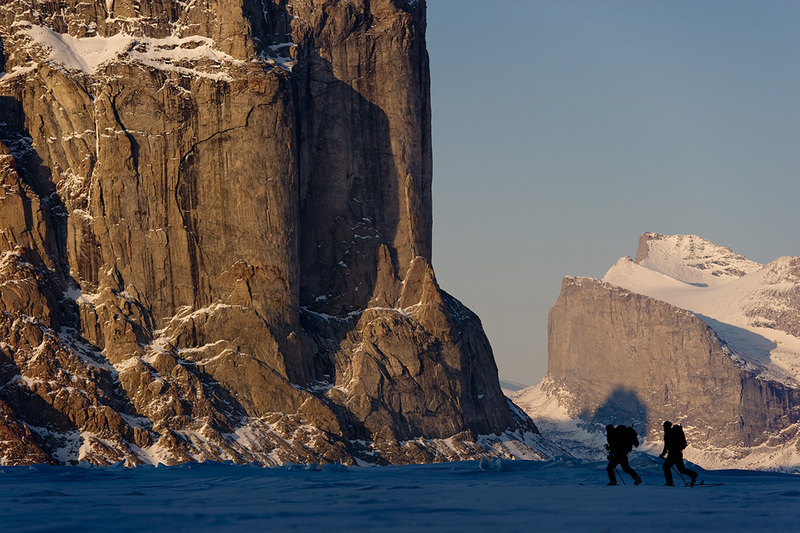 Arriving at our new camp after our Inuit guides waved goodbye was the remotest I had ever felt. The freezing temperatures and isolation left very little room for error. All our equipment had to function properly in order to keep us alive. Life became as simple as functioning stoves and the cover of tents and sleeping bags. The possibility of a rescue would have been a matter of days, not hours. 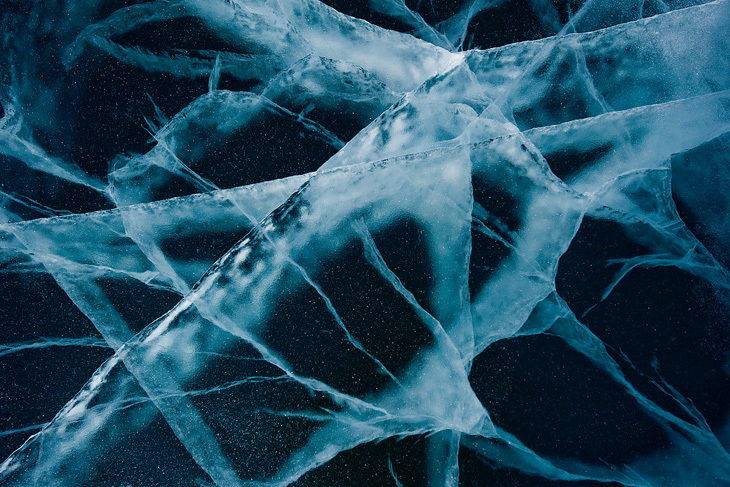 From the moment we arrived on the ice we were always scanning the white horizon for Nanuk. We had been told we would see polar bears and might have to deal with them entering our camp. We set up a perimeter around camp with skis and rope and slept with a shotgun at our feet. Each night, with the sleeping bag drawn tightly around my balaclava’d face, I would hear crunching and hoped it was simply shifting ice, not a polar bear about to poke its nose into our tent. 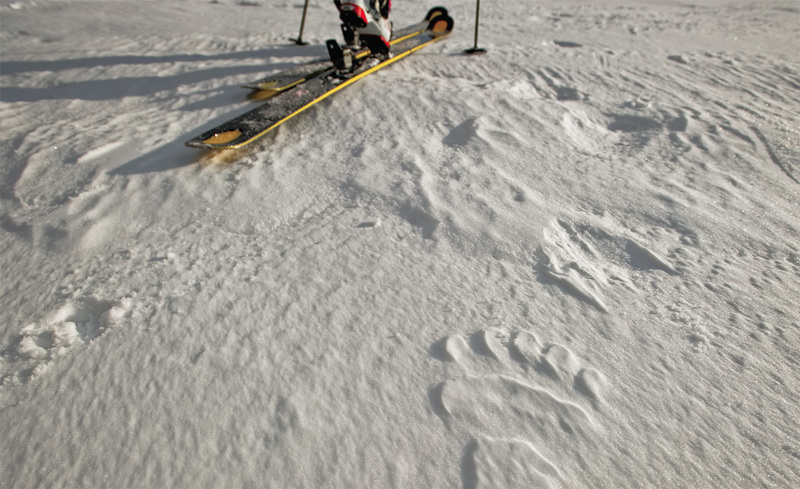 We never did see Nanuk, but found tracks in the snow close to our tents, left when we were out skiing. The couloirs were long, but we could move up them relatively quickly. With each step through chalky snow, a squeaky sound echoed off the walls. We found some lake-ice en route to one of the couloirs. There was very little snowpack and a lot of wind, so the ice was swept clean. Some of the couloirs were almost 4000 feet long; massive spaces that were always bigger and longer once we entered them. 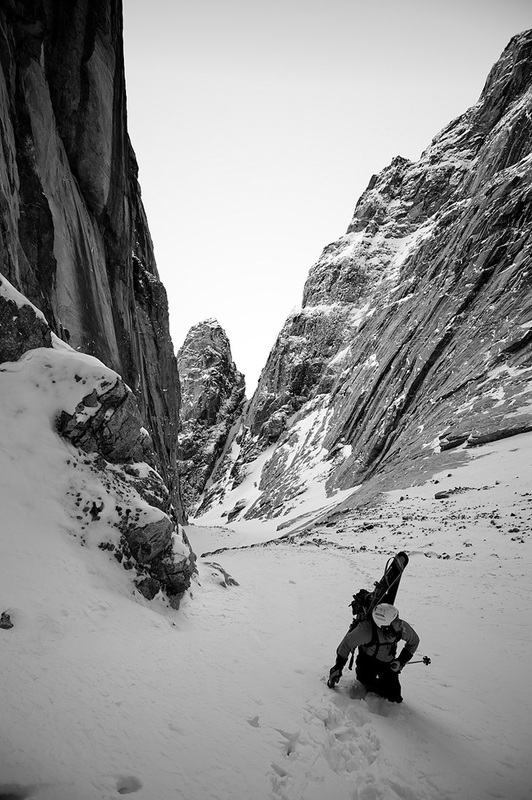 With each step into the chalky snowpack, you become more committed. As the consequences grow, each step requires more concentration. 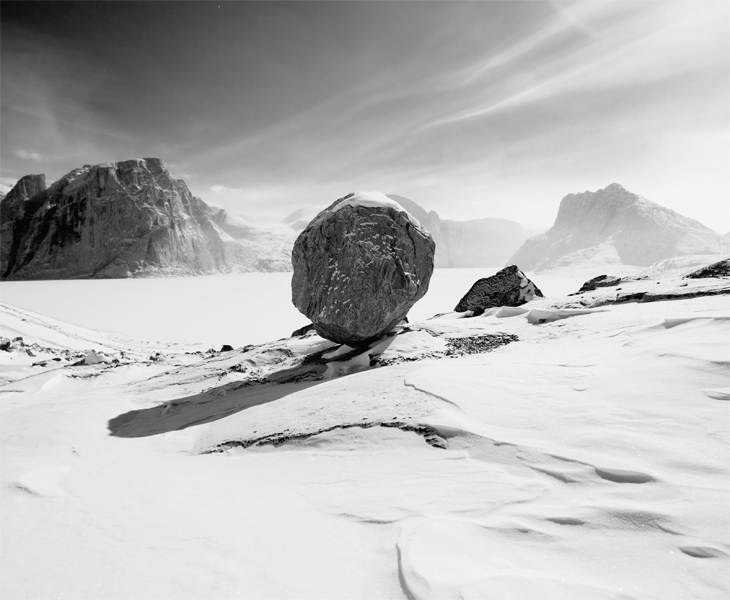 An erratic boulder in a terminal moraine; in the distance stands the Walker Citadel. At over 4000 feet, it is one of the tallest cliffs on the planet. In the adjacent bay, it would cast its massive afternoon shadow over our camp. 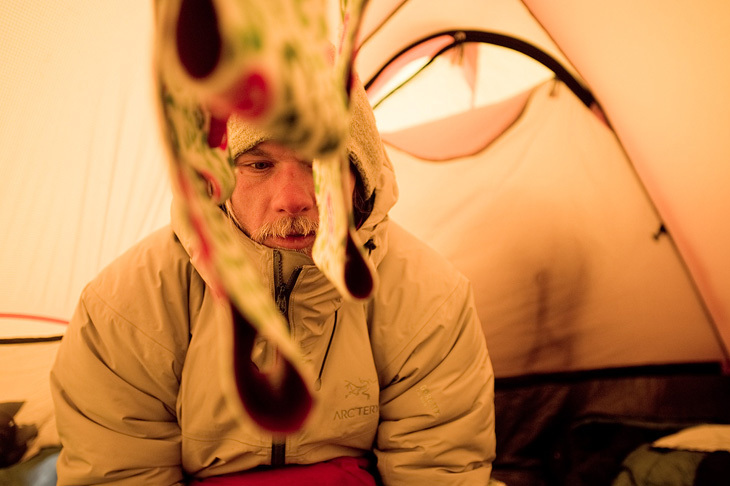 Chad Sayers frostbit his toes within days of arriving and had to spend five days in camp, alone. We left him the gun in case he encountered an unwanted visitor. I’m not sure what we would have done had we run into one.